Rami Sweis acquired his Bachelor’s degree in 1994 from the University of Illinois at Chicago and his medical degree in 1999 from University of Edinburgh. He trained in gastroenterology at Guy’s & St Thomas’ Hospitals, Kings College Hospital and South East Thames and completed his PhD from Kings College London in 2012. He was appointed as Consultant in Upper GI Medicine and Physiology at UCLH in 2014 and is the Upper GI Physiology Lead. He also holds an Honorary Clinical Senior Lecturer position at University College London. 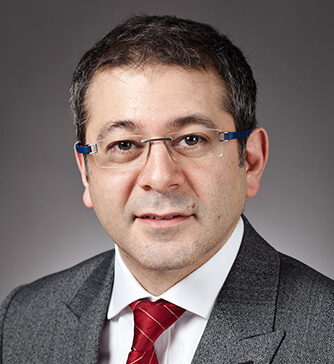 Rami Sweis’ research is primarily focused on trying to advance the methodology and utility of the technology used to investigate reflux and swallowing disorders, including catheter/wireless (Bravo) pH-monitoring, High Resolution Manometry, Endoscopy and Barium swallow. He continues to publish and collaborate with fellow experts and esophageal units nationally and internationally. He is currently PI in the UK (central site Leuven) of a multi-centre randomised trial comparing POEM with pneumatic dilatation. He is an active member of the international High Resolution Manometry Working Group, which is responsible for classifying esophageal disorders including the Chicago Classification. He is also a member of the Neurogastroenterology & Motility Committee of the British Society of Gastroenterology and has recently become President of the Association of GI Physiologists (AGIP). Rami Sweis is actively involved in improving training and Upper GI physiology. He regularly organises and chairs Upper GI Symposia and Hands-on Training in Upper GI physiology in the UK (through AGIP, NGM and at UCLH) and through other societies abroad. As a member of the Upper GI Endoscopy team at UCLH, Rami Sweis has a particular interest in investigating and managing complex benign and malignant upper GI disorders such as Achalasia (sequential pneumatic dilatation and per-oral endoscopic myotomy; POEM), Barrett’s esophagus (radio-frequency ablation and endoscopic mucosal resection), Gastric dysplasia (submucosal dissection) and upper GI cancer (dilatation, stent and laser).